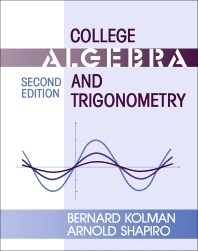 College Algebra and Trigonometry, Second Edition provides a comprehensive approach to the fundamental concepts and techniques of college algebra and trigonometry. The book incorporates improvements from the previous edition to provide a better learning experience. It contains chapters that are devoted to various mathematical concepts, such as the real number system, the theory of polynomial equations, trigonometric functions, and the geometric definition of each conic section. Progress checks, warnings, and features are inserted. Every chapter contains a summary, including terms and symbols with appropriate page references; key ideas for review to stress the concepts; review exercises to provide additional practice; and progress tests to provide self-evaluation and reinforcement. The answers to all Review Exercises and Progress Tests appear in the back of the book. College students will find the book very useful and invaluable.